The 2017 Masters Tournament brings not only the official return of golf but the biggest fantasy golf contests of the year! 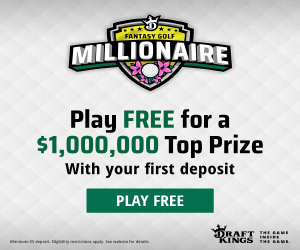 Our Affiliate partner DraftKings will have their Fantasy Golf Millionaire Contest where one player will turn $33 into $1 Million but there is better news in 2017! FanDuel, the other HUGE daily fantasy sports site has started offering fantasy golf all leading up to having cash games and large fantasy golf contests for the 2017 Masters Tournament. Each year we like to look ahead as to what fantasy golfers you should look at picking for your lineups that you will want to pair with some of our 2017 Masters Sleeper Picks to create a lineup that should give you a legit shot at winning one of the big money tournaments that will be offered. Spieth’s record in his 3 appearances at the Masters – T2, 1, T2…he should almost automatically be in all your fantasy golf lineups when you can fit him in. I can guarantee that I will have him somewhere on my Who Will Win the 2017 Masters Tournament page but as a fantasy pick for your FanDuel lineup…he’s a no brainer to try to get into your lineup! Day loves to play at Augusta and aside from one WD he has never missed a cut. Day has fun at the Masters each year bringing his wife and kids and making it a family trip and that loose attitude is what helps him score great points for fantasy players. He has the talent to win in any major he is in. He will be high priced but a bit of a bargain compared to some of the other guys listed. It seems like ever since he won the US Open last year DJ has no more pressure on him and he is just killing it on the golf course. He has won multiple times since his major win and is now one of the best golfers in the world. His last two finishes at Augusta were a T4 and T6…and that was before the pressure was taken off of him…who knows what the 2017 Masters will bring. I basically put Matsuyama in over 50% of my fantasy golf lineups in majors because I honestly think that his game is good enough to win every tournament or at least finish in the top 10. He is no longer the cheap option at DFS Golf sites but he is a threat to win the 2017 Masters and every other tourney that he is in. I love this kid’s game! Last year he was good and at the Masters he finished in 39th place. So far in the 2017 PGA Tour season he has 3 wins and could snag a few more before the year is done. He will be in the upper price range at DraftKings but nowhere near what some of the other guys on this list will be so if you are using a strategy of fading some of the favorites having Thomas on your team is a must! OK, so we aren't experts at making golf picks but we do use tools to help us make our picks and do pretty well. One site we use is GolfStats.com. 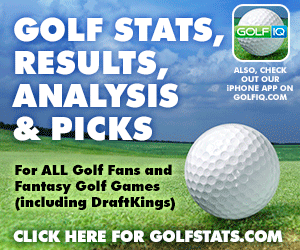 They are a one stop shop for any stat you could use in doing research for the Masters or any other PGA Tournament.